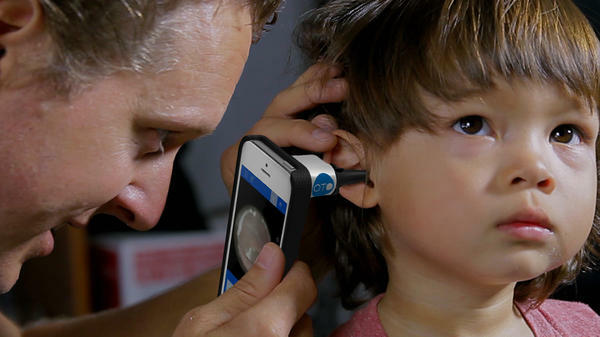 The San Francisco-based startup CellScope has built a tool to do ear exams at home, instead of going to the doctor. 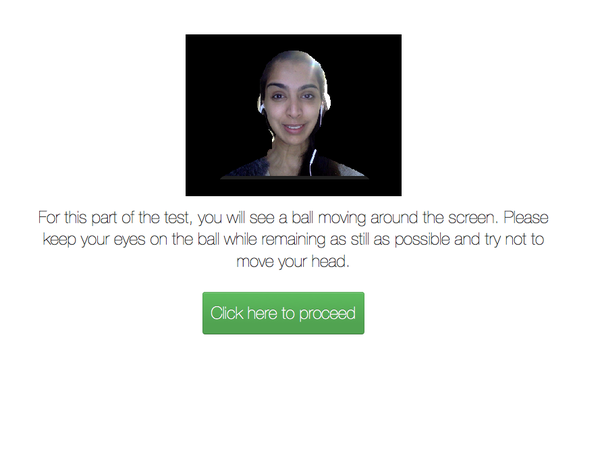 Neurotrack is designing an online quiz to test if users show early signs of Alzheimer's. To take it, you fit your head into an on-screen cut out, to align your eyes with the webcam. When your kid's ear is throbbing at 2 a.m., you might want to grab the car keys and head to the emergency room. But now you can pick up your iPhone instead. A startup called CellScope has built a little ear probe that you clip on top of your iPhone camera. The footage streams into an app where you can view the inside the ear. You could be tempted to use this $79 device to diagnose yourself, and not seek real medical care, even if you needed it. But CEO Erik Douglas says CellScope isn't replacing the doctor. It has doctors on call who analyze ear footage in under two hours, so families get medical care more efficiently. "The ones that have been the most enthusiastic about it so far have been those families that are in the doctor's office once a month for ear infections," Douglas says. This week, Las Vegas hosts the International Consumer Electronics Show where companies large and small set up shop in the giant convention center to demo their latest cars, TVs, games and gadgets. This year a new wave of trackers and online tools, wristbands and apps, are hitting the show — ones that collect your vital signs for medical purposes. "There are thousands of people taking the test, and then we're working with pharmaceutical companies to help them develop the drugs," says Elli Kaplan, Neurotrack's CEO. You sit in front of your laptop and look at a series of images. Your camera watches where your eyeballs focus and fail to focus in order to identify if you're showing early signs of the disease. Healthy brains gravitate to new images but brains that are deteriorating stick with what is familiar, Kaplan says. "It's only possible now, or only possible in the last few years, because Web camera technology has improved so dramatically," Kaplan says. The test is not yet approved by the Food and Drug Administration. Kaplan says when it is, a medical expert would call to discuss results. Telemedicine is not risk free. Cyberattacks are increasingly targeting health care data that's stored on the cloud, according to federal statistics. Still, enthusiasts say, the rewards outweigh the risks. "In under five years, if we want, we'll be able to measure pretty much every aspect of clinically useful physiology from our home," says Malay Gandhi, managing director at Rock Health. "We won't have to go into an office." Gandhi's company invests in medical startups that already have, or are applying to get, FDA approval. He says that means those startups have quality control and they'll deliver accurate data that doctors actually want to use. And he says, they'll help doctors keep an eye on their patients from a distance. Take CellScope's ear device, which is registered with the FDA. "Well I can just pull up the video and look at it tomorrow," Gandhi says. "I don't need to make a decision on the spot. And if it's fine, not changing, why prescribe antibiotics?" At this year's Consumer Electronics Show, there are nearly 300 "health and biotech exhibitors" — up 35 percent from last year. And while Apple is not making a splash here, experts say the iPhone and the company's HealthKit are poised to be the basic tools that will get us into self-tracking for medical care. The annual International Consumer Electronics Show is filling the city's hotels and convention halls. There are curved TV screens, video eyewear and devices to track your mood or your fitness. And there's a growing wave of tracking devices and apps that you can use for medical purposes. NPR's Aarti Shahani is in Las Vegas. AARTI SHAHANI, BYLINE: Let's start with the basic ear examination. When your kid's ear is throbbing at 2 a.m., you might want to grab the car keys and head to the emergency room. But, Erik Douglas says, grab your iPhone instead. ERIK DOUGLAS: So I'll go ahead and - I'm going to pull your eardrum - or your ear - back a little bit to be able to get a clear view. SHAHANI: Douglas is CEO of CellScope and we are playing doctor. He's not an M.D. SHAHANI: CellScope has built a little ear probe that you clip on top of your iPhone camera. The footage streams into an app. He shows me. DOUGLAS: And right down here, that's your eardrum. SHAHANI: I've never seen my eardrum before. DOUGLAS: (Laughter). Well, that looks like healthy one. SHAHANI: My eardrum looks like a translucent blob. It's the ultimate selfie. I could be tempted to use the $79 device to diagnose myself and not seek real medical care, even if I needed it. But, Douglas says, CellScope isn't replacing the doctor. They've got doctors on-call who analyze ear footage in under two hours. So families get medical care more efficiently. DOUGLAS: The ones that have been most enthusiastic about it so far have been those families that are in the doctor's office once a month for ear infections. SHAHANI: And let's say you have a disease that does not have a cure - like Alzheimer's. Elli Kaplan's Neurotrack is trying to crowdsource the cure. ELLI KAPLAN: There are thousands of people taking the test. And then we're working with pharmaceutical companies to help them develop their drugs. SHAHANI: Neurotrack is developing an online quiz whose effectiveness is a wide-open question - there's no definitive way to diagnose Alzheimer's. You sit in front of your laptop and look at a series of images. Your camera watches where your eyeballs focus and fail to focus, to identify if you're showing early signs of the disease. KAPLAN: It's only possible now or only possible in the last few years because web camera technology has improved so dramatically. SHAHANI: The test is not yet approved by the Food and Drug Administration. Kaplan says when it is, a medical expert would call to discuss results, not just throw out a big, blunt red-alert. Telemedicine is not risk-free. Cyberattacks are increasingly targeting health care data that's stored on the cloud. Still, enthusiasts say, the rewards outweigh the risks. MALAY GANDHI: In under five years, if we want, we'll be able to measure pretty much every aspect of clinically-useful physiology from our home. SHAHANI: Malay Gandhi makes a production. GANDHI: We won't have to go into an office. SHAHANI: Gandhi is managing director at Rock Health. His company invests in medical startups that already have or are applying to get approval from the FDA. He says that means they've got real quality control. They'll deliver accurate data that doctors actually want to use. And he says they'll help doctors keep an eye on their patients from a distance. Take that ear device, which is registered with the FDA. GANDHI: Well, I can just pull up the video and look at it tomorrow. I don't need to make a decision on the spot. And if it's fine - not changing - why prescribe antibiotics? SHAHANI: At this year's Consumer Electronics Show, there are nearly 300 health and biotech exhibitors, up 35 percent from last year. And while the company Apple is not making a splash here, experts say the iPhone and its health app are poised to be the platform - the basic tool kit that gets us into tracking ourselves for medical purposes. Aarti Shahani, NPR News, Las Vegas. Transcript provided by NPR, Copyright NPR.